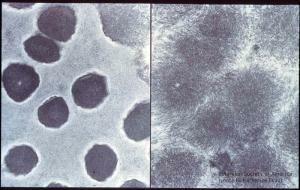 Cross sections through pores filled with P-protein. BSA Plant Images Online - Cross sections through pores filled with P-protein and through masses of loose P-protein located at some distance from the sieve plate. Echium plantagineum petioles. Cross sections through pores filled with P-protein and through masses of loose P-protein located at some distance from the sieve plate. Echium plantagineum petioles.